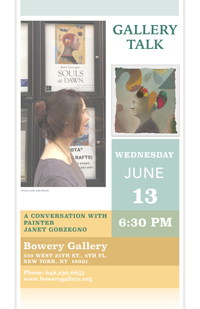 PRESS RELEASE: Painter Janet Gorzegno's fourth show at the Bowery Gallery features new works in gouache on paper that invent for contemplation glimpses of the human—her recurring motif is the human head, which appears as a symbol of human consciousness. Gorzegno's intimately sized paintings discover their form from within; they concentrate the eye on serene faces that appear wrapped in stillness as if attending a shift in consciousness that has not yet happened, but is about to occur. Each of these intense yet compassionate countenances invokes its own in-between or liminal state of being. The heads seem paused, as if between actions or thoughts, as if waiting for something to happen. Their liminality seems related to their stillness—neither here nor there, timeless and eternal. While Gorzegno’s heads, mostly profiles, are created entirely from imagination, they seem to possess distinct personalities and missions that invite reflection on themes of awareness, death, and transformation. These paintings—some reminiscent of the sacred art of icon painting, others evocative of early portraits, some appearing as emissaries from imagination’s keep—are based on no particular canon of creation, but many of them explore limits of the icon. They test the visual tension between abstraction—with its vivid geometries and colors—and naturalistic portrayal. But if they test the boundaries of form, they also distill and concentrate aspects of human existence. 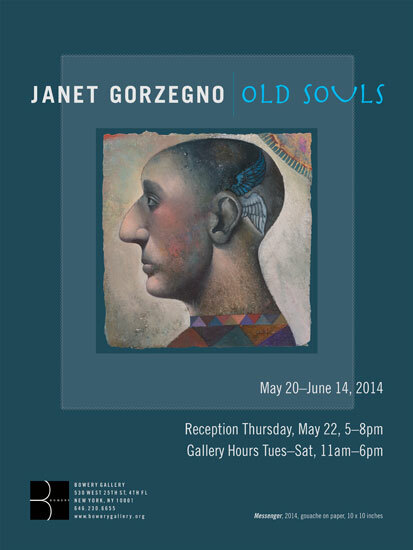 Janet Gorzegno studied painting at the New York Studio School and received her MFA in painting from Yale University. Her abiding interest in sacred art forms has led her to engage in hands-on study of icon writing and Thangka painting with Master practitioners. Her work has been exhibited widely in numerous juried and invitational shows. She currently lives in Hattiesburg, Mississippi, where she teaches drawing and painting as a Professor of Art for The University of Southern Mississippi. PRESS RELEASE: In her current exhibition at the Bowery Gallery, Janet Gorzegno presents intimately scaled works in gouache on paper that feature heads in profile as images for contemplation. In this subtle and poetic series, Gorzegno explores themes of spiritual awareness and alignment. Her paintings reveal a balance between conscious forming and acceptance of random, painterly occurrence. Heads in profile are a thread throughout the works, with some evocative of icon painting. The faces for these heads demonstrate different qualities of attention, from indrawn, peaceful contemplation to moreoutward, worldly expression. The paintings, when seen together, evoke a kind of journey or evolution of the soul as it moves through and experiences different states of emotion and thought. 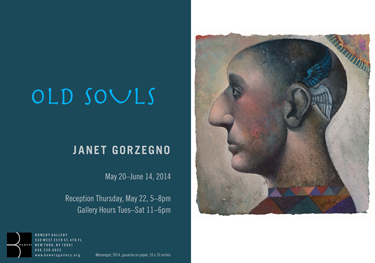 Gorzegno’s paintings are an extension of the humanist tradition. Her sense of form is descendent from time-honored, figurative painting,like that of early Italian fresco painting or Northern Renaissance portraiture. The spiritual focus in Gorzegno’ work gives it current relevance, as abstract qualities, of color, shape and texture, resonate in a contemporary setting. 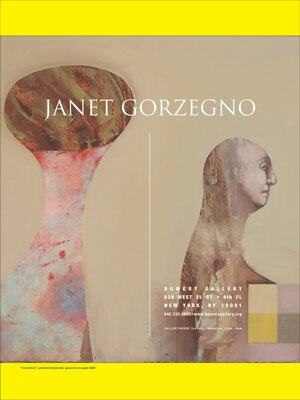 Janet Gorzegno studied painting at theNew York Studio School and received her MFA inainting from Yale University. This is her third solo exhibition at the Bowery Gallery. 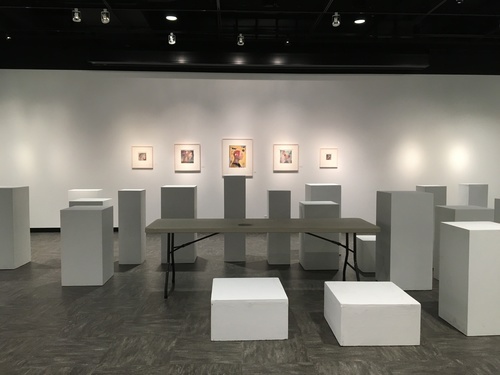 She has also exhibited in numerous featured and group shows and recently was a fellow at the Virginia Center for Creative Arts. 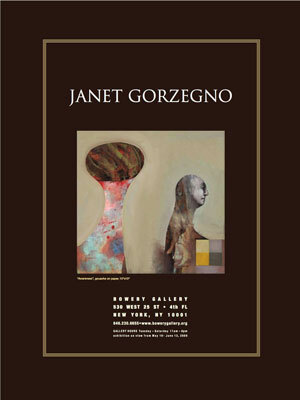 Other recent recognition for Janet Gorzegno includes a Best in Show award from the Northwest Art Center’s 2008 Paperwork’s Competition, which earned her a solo exhibition that took place at the Northwest Art Center in January 2009. She currently holds the rank of Professor of Art for the University of Southern Mississippi where she teaches drawing and painting.